The visualisation of life at OneZoom.org shows all branch points as a split into two branches. Yet the Open Tree of Life, from whom much of the data is gathered, have many examples of large polytomies, where many branches emerge from a single point. These are almost entirely cases where a large number of species have been classified by taxonomists into a single group (say the ragworts), but where the OpenTree has not incorporated any extra studies that can resolve relationships between species within the group. I am embarking on a Career as a James Bond baddie, and I want to make sure everything is very carefully planned. 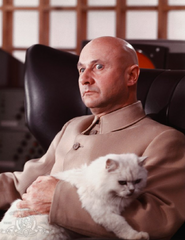 I am under no illusions that Commander Bond will thwart my first efforts to take over the world, however I am keen to become a recurring character, and that’s where you come in. I intend to escape from Mr Bond at the last minute and I intend to populate an island or other planet, depending on budget. However I am not clear how many men and how many women I will need to take with me to ensure we do not have issues with inbreeding in the population creating genetic disorders and the like. How many people do you need to create a new race of people? When I helped write the Ancestor’s Tale, one of the big tasks was to make a human-centred tree of life: to list of all the point at which, backwards in time, the human lineage joined with lineages of other extant lifeforms. In February last year I was forwarded an email from someone using these “rendezvous points” as the basis for a song and story for children. She had seen the O’Leary paper and wondered how much revision was needed to our original list. A phylogenetically organised display of data for all placental mammal species. Red pixels are those without a picture on EoL. Modern technology, coupled with molecular taxonomy, means we now have very large evolutionary trees: ones with tens or hundreds of thousands of species. In fact, the Open Tree of Life project aims to create a tree of all living things, which would have millions of species. The obvious question is how to display these enormous amounts of data. 670 descendants of Concestor 13, appropriately arranged. I’ve been meaning to write about this for a good while, ever since the release of a paper which hit the science headlines last year. For the first time to my knowledge, researchers have tried to do professionally what I, together with a graphic illustrator, did in an amateur fashion for The Ancestor’s Tale. I’m talking about attempting to reconstruct what our distant ancestors looked like, an intriguing task that also leads to some striking visual possibilities.